PV Cycle is a European solar panel recycling body issuing the PV Cycle certification for manufacturers being part of the body’s recycling scheme. PV CYCLE is a European Association for voluntary take back and recovering of photovoltaic modules with main offices in the Renewable Energy House in Brussels, Belgium. The history of the association dates back to the release of the first publications on waste treatment, WEEE, life cycle issues and voluntary take back systems in 2003, along with the publication of the Ökopol Study on waste treatment of modules in the same year. The Ökopol Study was the first of its kind to address the issue of waste management in the PV Industry. Following several workshops on this issue, the PV Cycle Initiative started in 2005, which aimed at creating a scheme to institutionalize recycling in the PV industry. 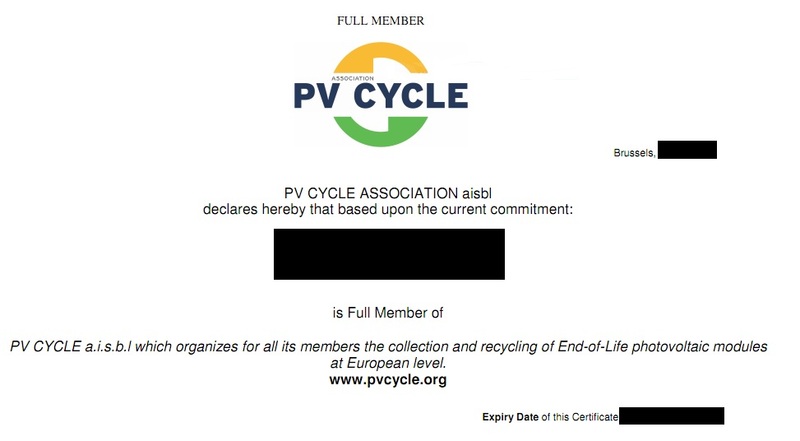 Two years later, PV Cycle Association (in short: PV Cycle) was founded on 5 July 2007, with the objective to implement recycling schemes and programs for the treatment of all kinds of end-of-life-cycle photovoltaic modules. In this regard, PV Cycle aims at creating a voluntary, completely green and sustainable industry-wide take-back and recycling program within the value chain of the solar industry, by incorporating the issues of waste management, post-usage treatment as well as re-usage and thus saving scarce and capital- as well as energy-intense raw material. Membership at PV Cycle – which is subject to fees – is quite prestigious for manufacturers to give their brands a green touch, which is particularly attractive within the markets of the European Union and increasingly also in East Asia. However, the recycling scheme itself is to-date only applicable in the EU and EFTA countries. The association has by end of 2011 more than 220 member companies. What are PV CYCLE certifications? Manufacturers in the PV industry that join PV Cycle obtain after successful evaluation and integration into their voluntary-module-take-back-scheme an official PV Cycle certification. Buyers of modules from PV CYCLE-certified manufacturers are thus assured that their purchases are much more environmental-friendly and that the manufacturer works to reduce the environmental impacts on all stages of the product life cycle, starting from raw material sourcing to end-of-life collection and recycling. How are the end-of-life PV modules collected and processed? Entirely financed by fees from its members, PV CYCLE is operational in all EU-28 Member States and the European Free Trade Association (EFTA) countries, thus adding Iceland, Norway, Switzerland and Liechtenstein to a total of 31 countries to date. Any wholesaler, retailer and installer of PV modules can upon application become a collection point of PV modules. The collection, transport and recycling costs are covered by the producers, importers and re-branders. The modules are then taken by PV Cycle to recycling plants. The recycled materials are then used in new products, such as even PV modules. Where can I get more information on PV Cycle and its PV module recycling scheme? The study on The Development of a Take Back and Recovery System for Photovoltaic Products published in November 2007 outlines in full detail the whole scheme and can be found here.